The creative work of Andrei N. Kolmogorov is exceptionally wide-ranging. In his studies on trigonometric and orthogonal series, the theory of measure and inte-gral, mathematical logic, approximation theory, geometry, topology, functional analysis, classical mechanics, ergodic theory, superposition of functions, and in- formation theory, he solved many conceptual and fundamental problems and posed new questions which gave rise to a great deal of further research. Kolmogorov is one of the founders of the Soviet school of probability theory, mathematical statistics, and the theory of turbulence. In these areas he obtained a number of central results, with many applications to mechanics, geophysics, linguistics and biology, among other subjects. 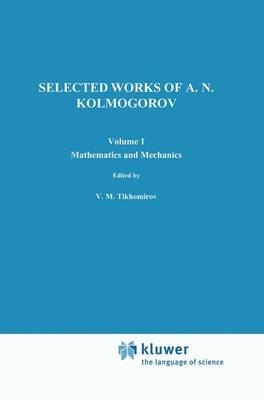 This edition includes Kolmogorov's most important papers on mathematics and the natural sciences. It does not include his philosophical and ped-agogical studies, his articles written for the "Bolshaya Sovetskaya Entsiklopediya", his papers on prosody and applications of mathematics or his publications on general questions. The material of this edition was selected and compiled by Kolmogorov himself.